At just 42 years old – Din Yan from China has defied all odds by running an astounding 6 marathons in a year in 6 different countries, making her the first woman to complete the marathons in Southwest China’s Sichuan province. Din, who has competed in countries such as Berlin, Chicago, New York, Tokyo, Boston and London, officially received her six star finisher medal in Jeju, the Republic of Korea on the 29th of May 2016. Din, who is constantly busy with work has alienated herself from her 16 year old son (who lives with his grandmother) but she states: “I took up running and marathon for the sake of my son” Ding Yan told West China Metropolis Daily. According to the China Daily, in Nov 9 2014, Yan successfully completed her first marathon – Xichang Half Marathon in Sichuan. And in January 2015, she spent 4 hours and 19 minutes completing her first full marathon in Xiamen – a major city on the southeast (Taiwan Strait) coast of China. The Berlin Marathon was not an easy job for Ding as her breathing came to a toll for the first 28 kilometers. The marathons are all about assisting each other, fortunately enough she met an old woman told her to adjust her breathing, and she continued the marathon with her sustained breathing. Initially, the Berlin Marathon ended with 269 minutes and one second. 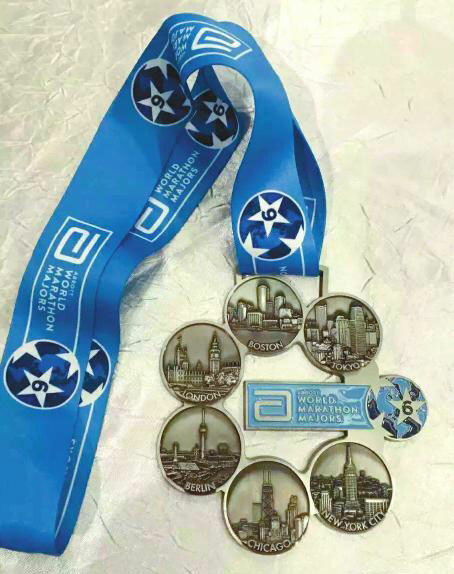 From then on, the 42-year-old Ding completed Chicago Marathon on Oct 11, 2015 – New York Marathon on Nov 1, 2015 – Tokyo Marathon in February, 2016 – Boston Marathon on April 18, 2016 and London Marathon on April 24, 2016. Ding Yan proves that you can still achieve anything that you want, without your age being the main barrier in your life. Thanks to Ding, her whole family has taken to running now. Besides her five-year-old daughter, 16-year-old son, even her husband (who is often busy with his career) runs with her whenever he is free.